Maharashtrian Wedding + Brazilians + Leah = FUN! 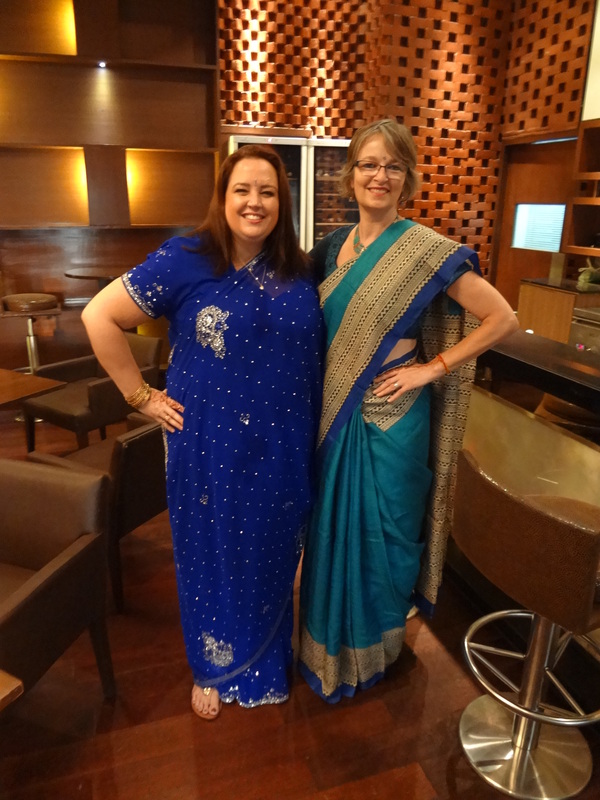 I went to meet my friend Leah for a wedding in Pune. 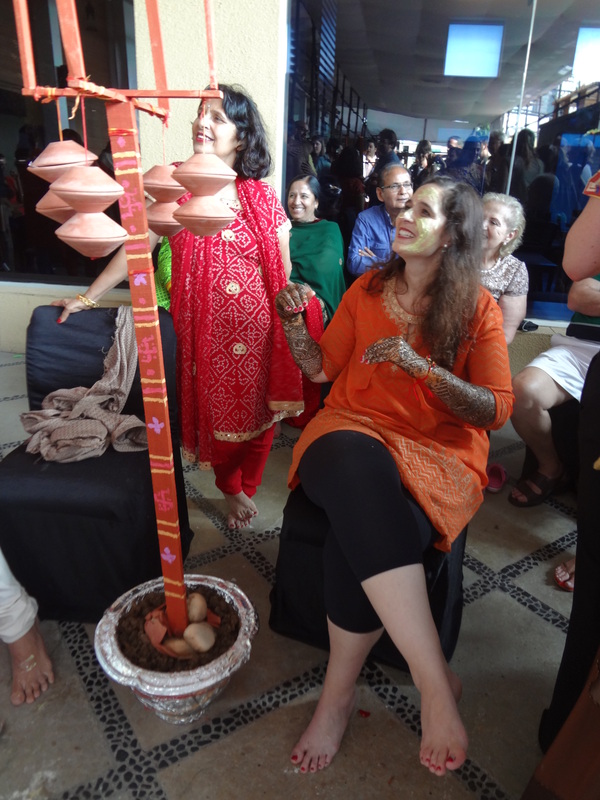 Her colleague Fabiana (originally from Brazil) was marrying Prateek (originally from Bombay) in a traditional Indian wedding (as traditional as it gets with Brazilian, American, Dutch, Argentinian, Mexican, Spanish, Italian and don’t forget Indian guests!). The day before the wedding they had both Haldi and Mehendi ceremonies. Haldi is when the bride and groom have their faces spread with a yellow turmeric based paste. It’s a natural antiseptic and is supposed to be good for the complexion and ward off evil spirits. 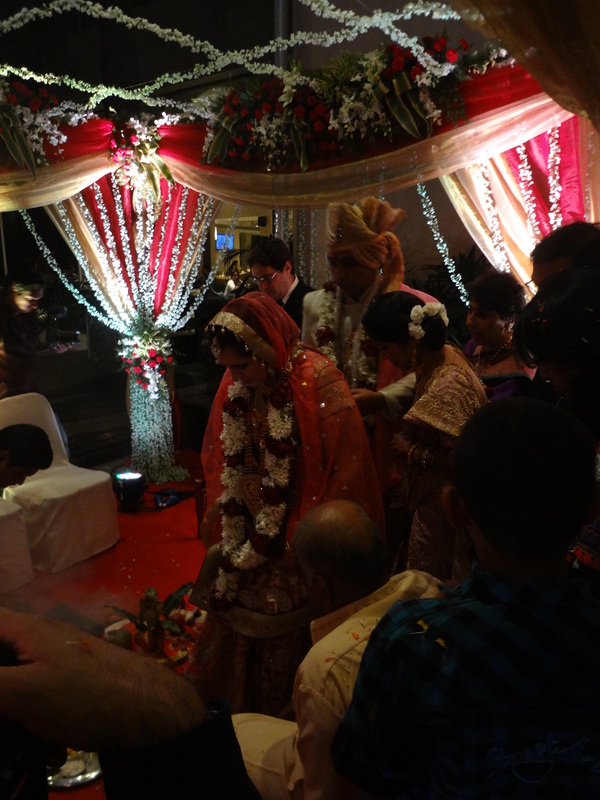 These ceremonies often get out of hand and the turmeric ends up being thrown around, especially onto unmarried guests. In this case the groom’s friends ripped off his kurta and poured a bowl of oil over his shoulders. He was a good sport about it, but then went around hugging friends and siblings with his oily self. The kangana, or sacred thread with amulets, were tied around the wrists of the bride and groom for good luck during the wedding. 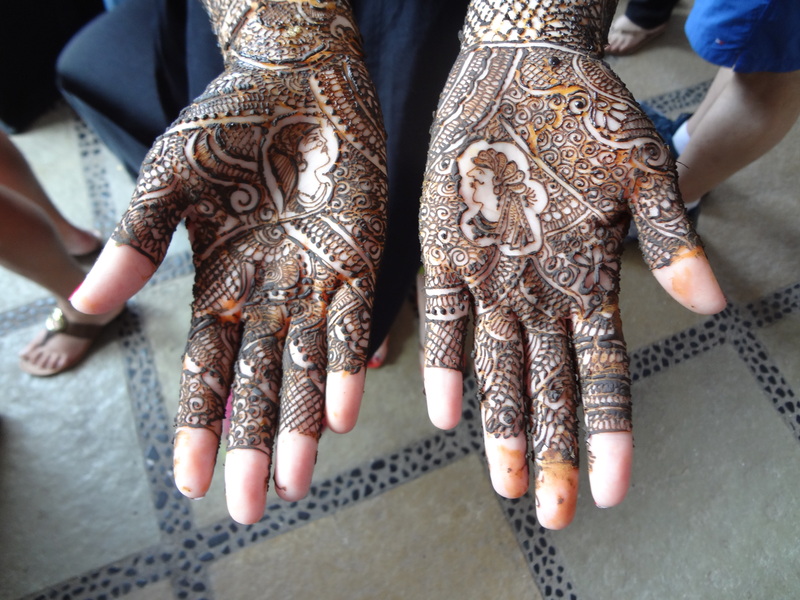 Mehendi was a much quieter ceremony in which most of the women at the wedding had their hands decorated with henna paste. The bride had the most elaborate decoration, on both hands and feet, going up to the elbows and knees. Fabiana had bride and groom images in the center of her palms. The paste must be left on as long as possible before flaking it off to get the deepest russet color. 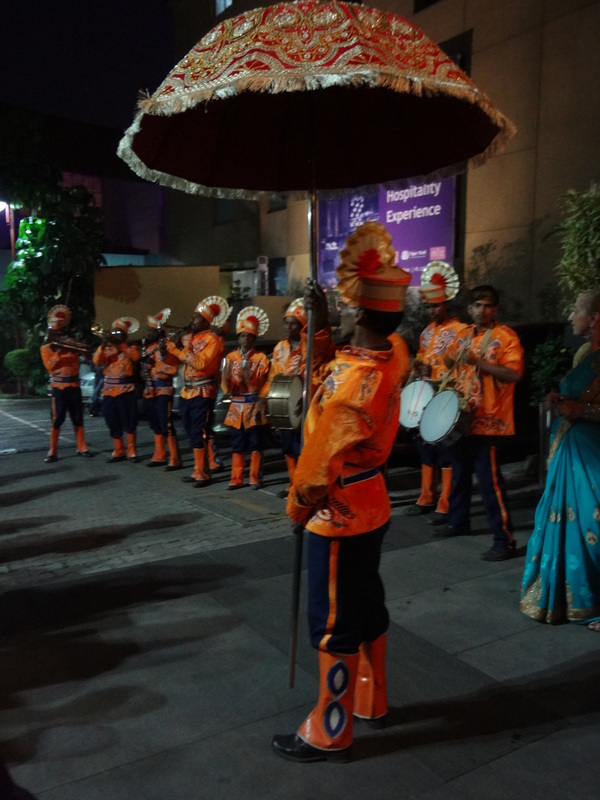 We kept it on all afternoon until it was time for the Sangeet, the big music and dance party. 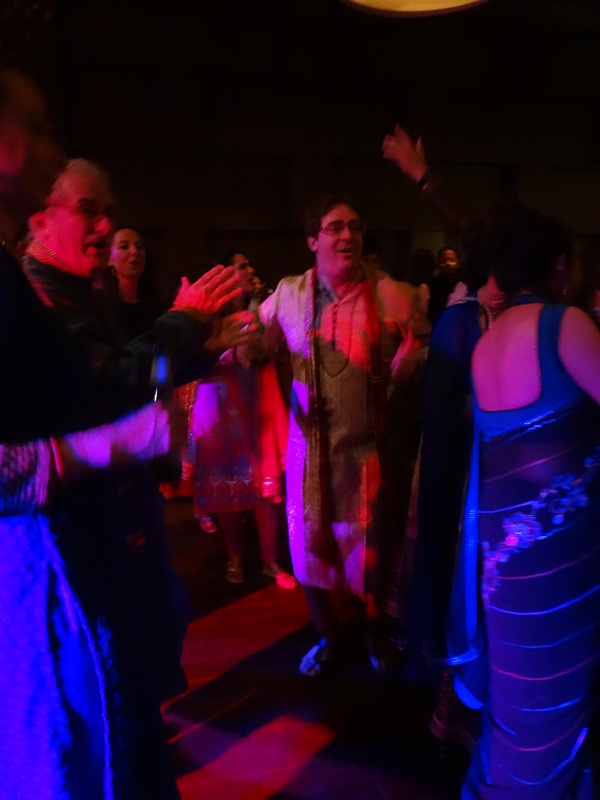 Everyone showed up for Sangeet in their pre-wedding finery for a nice dinner and then the dance music started pounding in the bar. Everyone danced together and sang the words to the songs. It was a riot of lights, color, glitter and noise. Many of the old timers stayed on the quiet terrace where we ate dinner, but a few danced up a storm with the younger crowd and had a blast. One adorable older man had some great moves and we told him so. Leah said he winked at her at breakfast the next day. Fabiana’s father and brother dancing. The next day the women dressed in their saris (a pretty big production) and the men went to the turban tying ceremony. The men from Fabi’s family wore yellow turbans and the men from Prateek’s side wore red. I loved watching everyone have their head wrapped, it is truly an art. 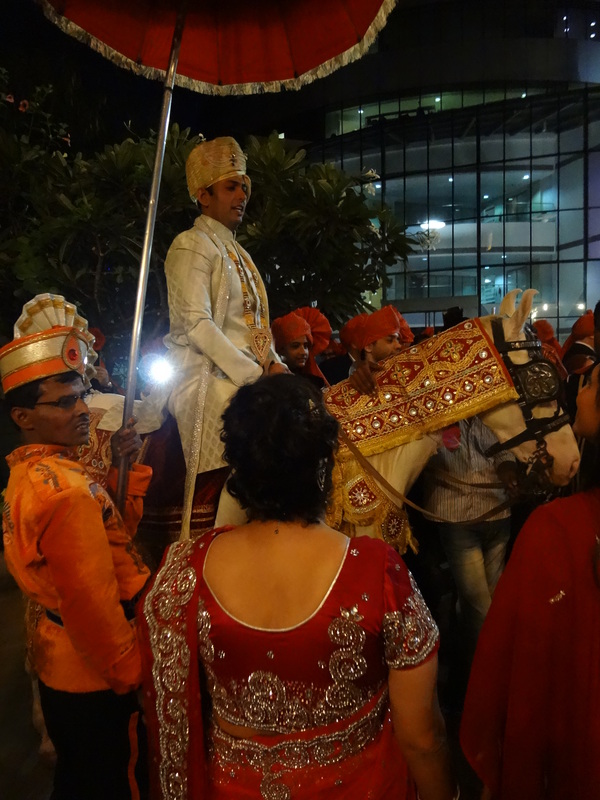 Prateek had a special white turban with embellishments, then he was brought downstairs for the Baraat procession in which the groom rides a white horse to the wedding. There was a band playing loud drumming music and the guests danced in the street. A string of crackers and some flower pots were lit at the front of the procession, a bar followed behind. Following on the heels of parties and ceremonies, the wedding seemed very quiet, and of course following ‘Indian time’ everything was very late. There were many more guests, but most stayed inside at the reception while the wedding was being performed. It was held outside, under a canopy of jasmine flowers, where the bride and groom circled a fire seven times, each circle representing the seven oaths the bride and groom make to each other. After the wedding Fabi and Prateek stood at the front of the reception hall with Prateek’s family to receive everyone. They looked very tired and hungry at this point and they still had more to come after midnight when the bride is taken to the grooms home and she has to bribe her way into their home. They play games to determine who will have the upper hand in the marriage (in this case Fabi won). Unfortunately Leah and I were done around midnight and didn’t attend this part. All in all it was a lot of fun and I was happy I was able to go. Thank you Fabiana and Prateek! I also took this opportunity to travel on to Aurangabad. 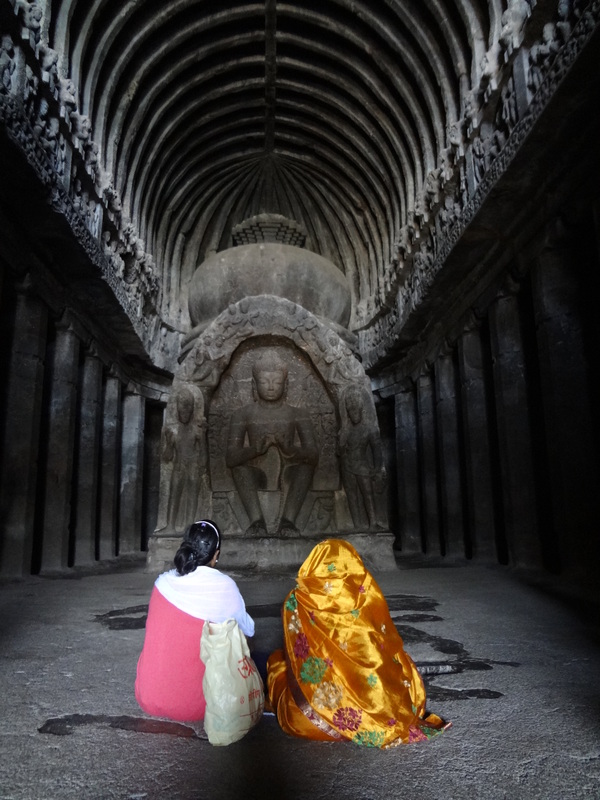 It is only a five hour drive from Pune and I couldn’t get this close to Ajanta and Ellora caves and not go. I have wanted to see these ancient caves for at least a quarter of a century, since I studied Asian Art History at Tufts as an undergrad. It sounds like a long time doesn’t it? Well it is! Here is a taste of what I saw……more to follow! Sounds like a lovely time. Glad you are experiencing so many wonderful things Mardy.